Maintained by Orta Therox, Peter Jihoon Kim, Blake Watters, Robert Böhnke. 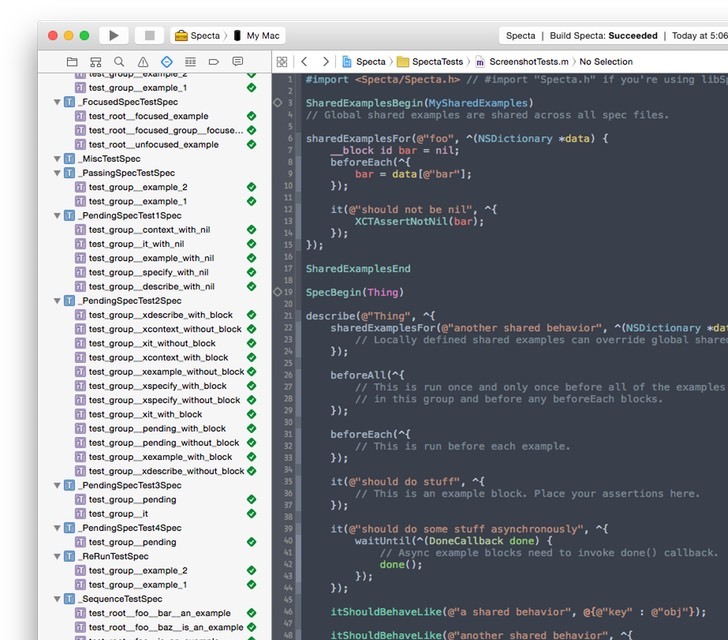 A light-weight TDD / BDD framework for Objective-C.
// Global shared examples are shared across all spec files. // Locally defined shared examples can override global shared examples within its scope. // e.g. to use an object prepared in a beforeEach block. beforeEach and afterEach are also aliased as before and after respectively. describe is also aliased as context. it is also aliased as example and specify. itShouldBehaveLike is also aliased as itBehavesLike. Use pending or prepend x to describe, context, example, it, and specify to mark examples or groups as pending. Use ^(DoneCallback done) as shown in the example above to make examples wait for completion. done() callback needs to be invoked to let Specta know that your test is complete. The default timeout is 10.0 seconds but this can be changed by calling the function setAsyncSpecTimeout(NSTimeInterval timeout). (before|after)(Each/All) also accept ^(DoneCallback done)s.
Do #define SPT_CEDAR_SYNTAX before importing Specta if you prefer to write SPEC_BEGIN and SPEC_END instead of SpecBegin and SpecEnd. Prepend f to your describe, context, example, it, and specify to set focus on examples or groups. When specs are focused, all unfocused specs are skipped. To use original XCTest reporter, set an environment variable named SPECTA_REPORTER_CLASS to SPTXCTestReporter in your test scheme. Set an environment variable SPECTA_SHUFFLE with value 1 to enable test shuffling. Set an environment variable SPECTA_SEED to specify the random seed for test shuffling. Standard XCTest matchers such as XCTAssertEqualObjects and XCTAssertNil work, but you probably want to add a nicer matcher framework - Expecta to your setup. Or if you really prefer, OCHamcrest works fine too. Also, add a mocking framework: OCMock. Specta is considered a done project, there are no plans for active development on the project at the moment aside from ensuring future Xcode compatability. Therefore it is a stable dependency, but will not be moving into the Swift world. If you are looking for that, we recommend you consider Quick. Run rake test in the cloned folder. Please use only spaces and indent 2 spaces at a time. Please prefix instance variable names with a single underscore (_). Please prefix custom classes and functions defined in the global scope with SPT. Run rake in project root to build. Add a "Cocoa/Cocoa Touch Unit Testing Bundle" target if you don't already have one. Copy and add all header files in Products folder to the Test target in your Xcode project. For OS X projects, copy and add Specta.framework in Products/osx folder to the test target in your Xcode project. For iOS projects, copy and add Specta.framework in Products/ios folder to the test target in your Xcode project. Add -ObjC and -all_load to the "Other Linker Flags" build setting for the test target in your Xcode project. If you encounter linking issues with _llvm_* symbols, ensure your target's "Generate Test Coverage Files" and "Instrument Program Flow" build settings are set to Yes. Copyright (c) 2012-2016 Specta Team. This software is licensed under the MIT License.